K2 is high and it is in fact so high that there exist exactly one point on earth higher than it. Although officially K2 is 237 m or 781 ft feet shorter than Everest there was a unique time in history once it was suspected that K2 might be higher than Everest! Ask a child to draw a mountain and most likely he or she will come up with a triangular figure with steep slopes. That is K2! The symmetrical shape of K2 is something which makes it a mountain that has no backdoor or easy route. Although Pakistani side is considered to be easier but it is not drastically different from the Chinese side. The word Karakorum means Black Rocks. K2 as the highest peak of this mountain range justifies the name. Its lacks snow and thus appears as a giant mass of bare rock and brittle ice making the climb more challenging. In addition strong winds on K2 blow off the snow, converting this snow white into a black beauty. If there had to be one killer other than freezing temperatures on K2 it would be wind. It is one of the major differences between winter and summer seasons on K2. In winters, Karakorams experiences a stronger jet stream than the Himalayas. 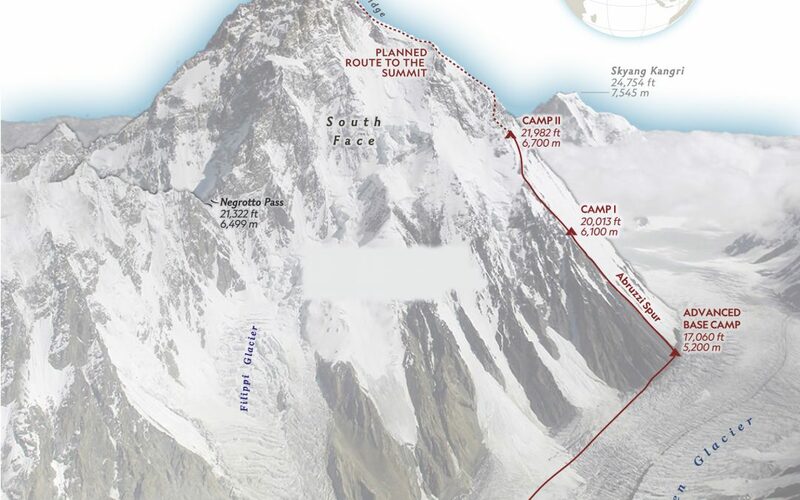 These gusts on K2 can literally pluck climbers off the side of the mountain. The freezing temperatures on K2 add just another challenge .The temperatures could drop up to -65 Centigrade on the mountain. In such conditions smallest of exposures could lead to frostbite , or even just touching bare skin to an ice axe can rip off a layer of skin. Reaching the base camp of K2 is a feat in itself. It almost takes a journey of one week on one of the world’s most beautiful and rugged treks to have the first glimpse of K2. The Baraldo River and the glacier itself offers great vistas yet it can be challenging as the last human settlement of Askole Village is almost nine days far from K2 Base Camp. On K2 especially in winter is time of low barometric pressure, which translates to even less available oxygen than during high pressure weather windows in the summer. Last but not the least .The mountains are defined by professionals in terms of being technical for negotiating. K2 in essence is a technically difficult climb which means if all the other factors are kept aside even than K2 remains a daunting challenge.